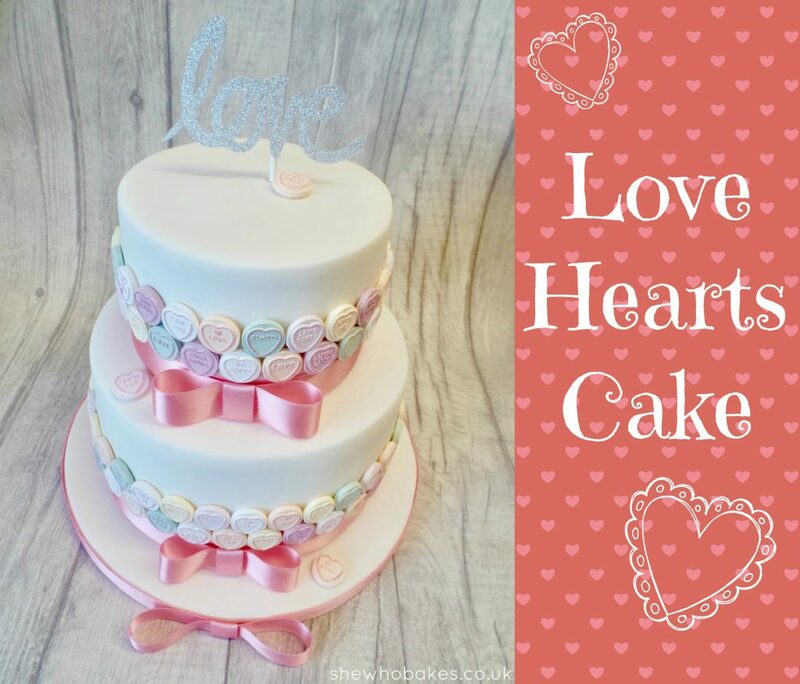 This sweet Love Hearts cake is perfect for Valentine’s Day or as a simple but stylish wedding cake. 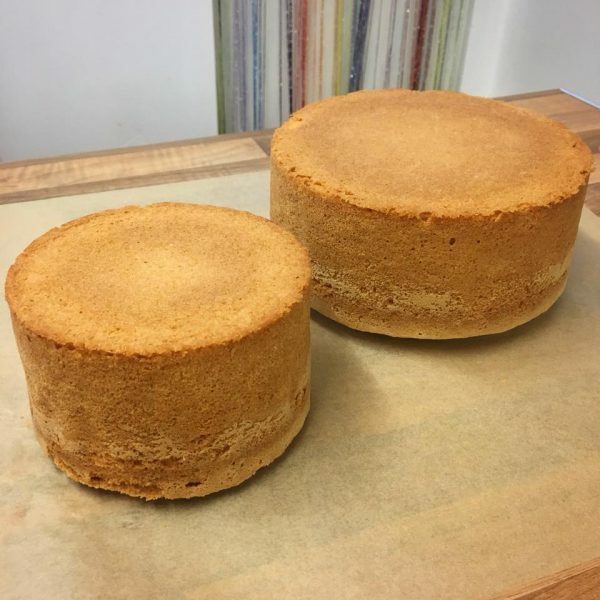 The cakes themselves are a 7″ round and 5″ round vanilla madeira (you can find the recipe I use here as well as a link to a converter if you wanted to bake it in other sizes). They are split twice and filled with vanilla buttercream, the recipe I use can also be found here. I baked them and then left them to cool upside down on greaseproof paper as I always do with celebration cakes. I then wrapped them well in cling film and left them overnight to firm up, ready to split, fill and ice the following day. I crumb coated them with more vanilla buttercream. I do two layers of buttercream, using a scraper and my palette knife to smooth it down to the cake which creates a lovely base to decorate. 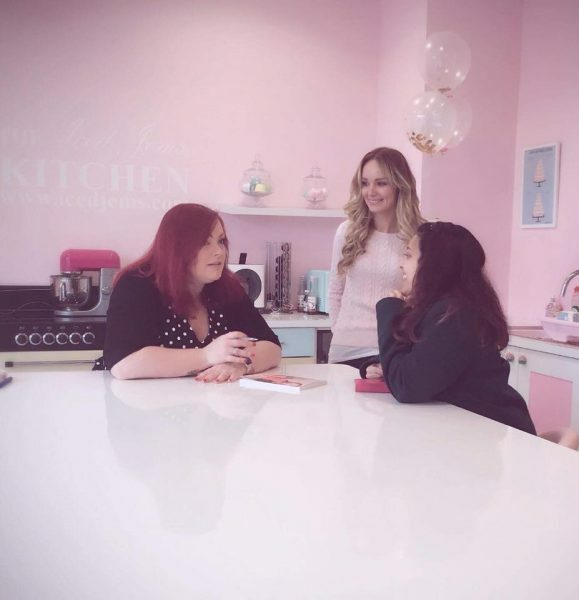 The following pictures are taking from my Instagram stories which I highly recommend to watch as I often post how to videos and step by step tutorials whenever I’m in the kitchen. After crumb coating it, it was time to cover in a layer of sugarpaste. 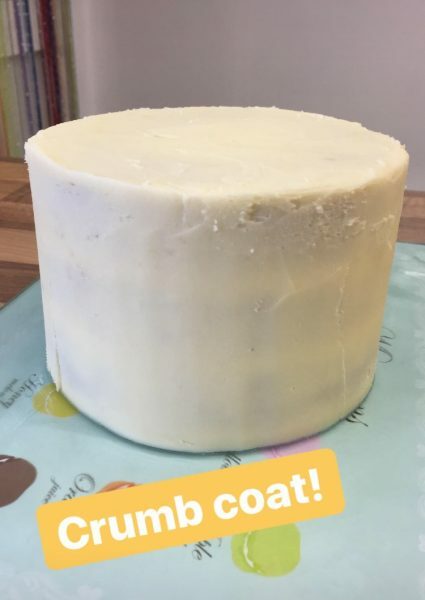 If you follow my social media you may have seen I was asking for opinions on a new type of Renshaw sugarpaste called ‘Extra’. I normally use Renshaw as my preferred brand of sugarpaste when decorating my cakes. I always find I get a good finish with it and it doesn’t tend to crease or tear. 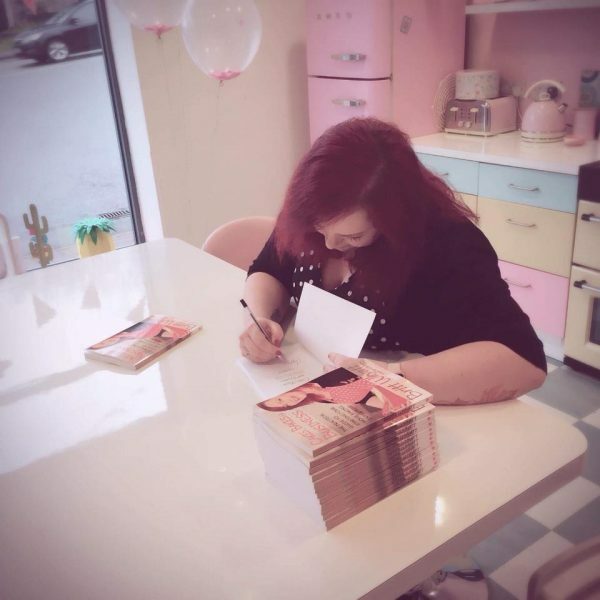 When I recently did my book signing and Q&A at Iced Jems, I picked up a pack of it with this very cake in mind. I was excited to try it as on the box it said it was ‘extra firm and extra elastic’. I must say I was very impressed with the product. It kneaded well, rolled well and most importantly, covered my cakes well. It felt strong and secure and it didn’t feel like it was creasing in any way. 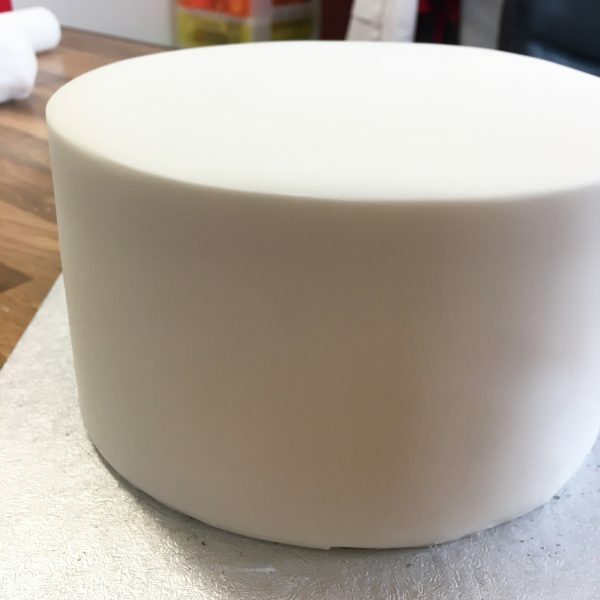 Sometimes when icing a cake, it’s the top edge that can tear under the weight of the sugarpaste but there were no marks and it was really easy to smooth too. 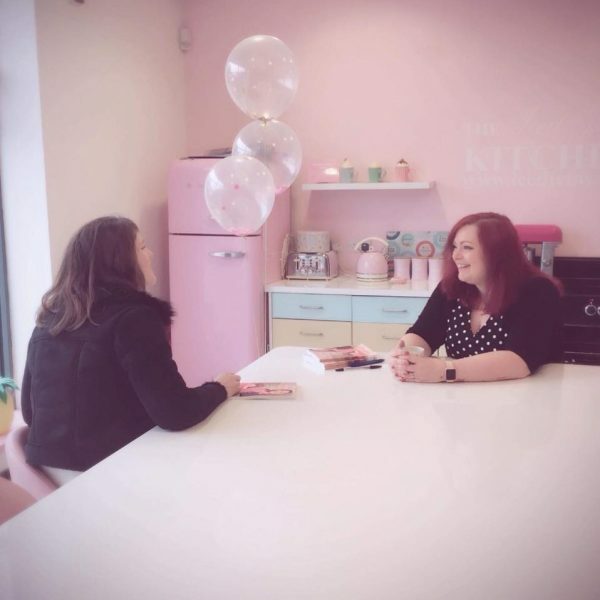 It’s definitely one I’ll be using again especially as I’ve got a lot of cakes to make this year; my 30th birthday party, my hen party, our wedding cake and my annual Halloween cake! Next step was to smooth the cake. Last year I completely converted from my usual plastic smoothers to the Super Sharp Edge Smoothers from Iced Jems. 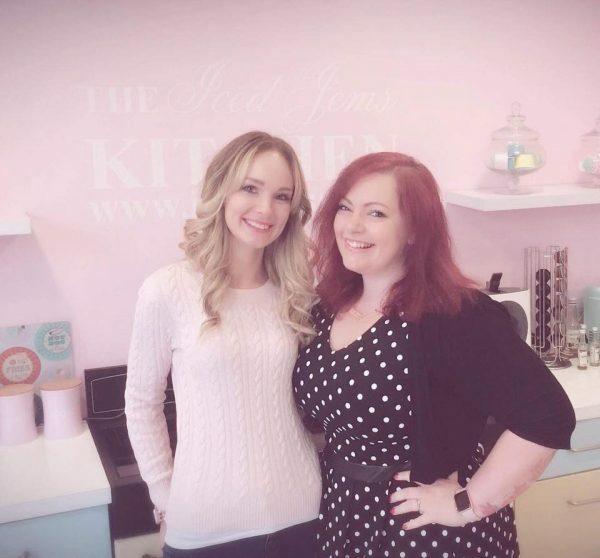 I have a full article and review on them here. They REALLY make a difference to your finished cake and I’m still amazes at what two little bits of acetate can do! 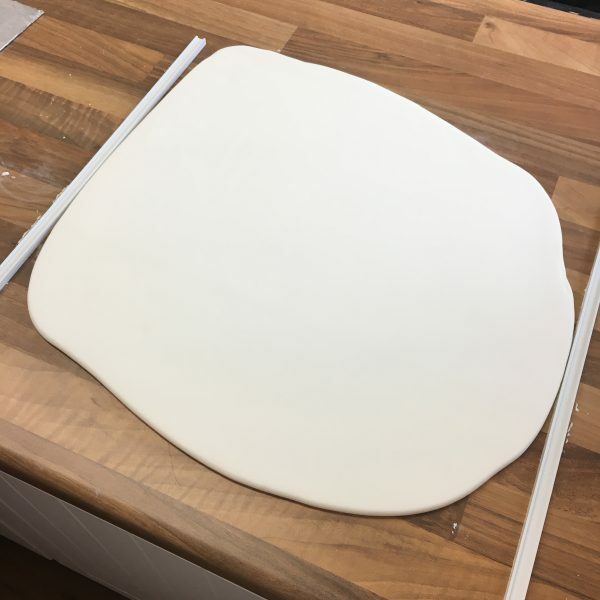 Below is a picture of the sugarpaste rolled out, then placed onto the cake before smoothing and then after smoothing. I mean LOOK at the difference!! I then left my cake to set and the icing to firm up. Ideally I would do this overnight but I as on a time limit with this cake and so I left it as long as I could (a few hours) and then started to stack it. Normally however, I would always leave an iced cake overnight before decorating, moving or stacking it. I like to allow the icing to firm up completely so I can move the cake around without any accidental damage to the icing. 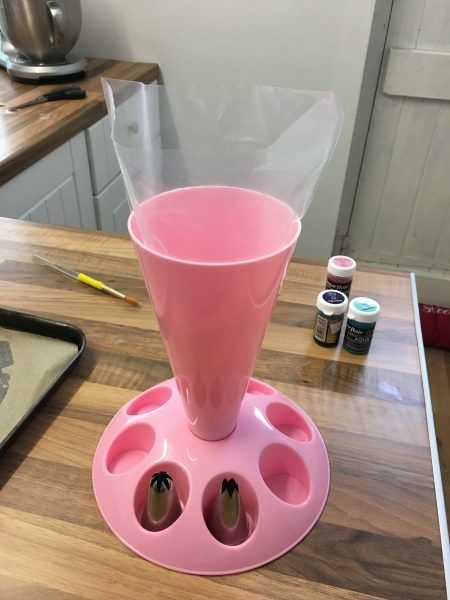 To stack the cake safely I firstly stuck down the bottom tier onto an already iced 10″ cake drum (always cover your cake boards!!). Then I placed five wooden dowels cut to size in a pattern into the middle of the bottom tier then I carefully stuck the top tier on with a little buttercream. Once my cakes were stacked, I stuck a 25mm baby pink ribbon around each of the tiers with a little double sided sticky tape on the back of one end of the ribbon. 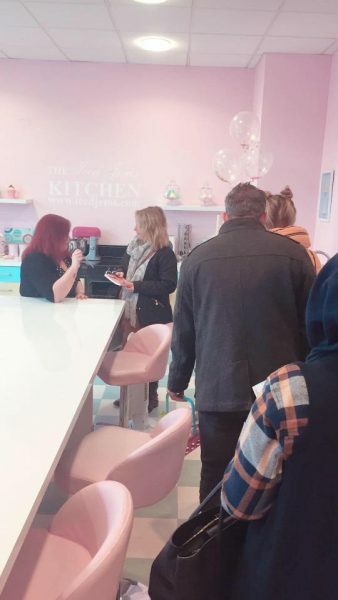 I also stuck 15mm baby pink ribbon around the iced cake board too. I then added bows to the middle. I’ve got a little photo tutorial on how to make fabric bows for cakes here. 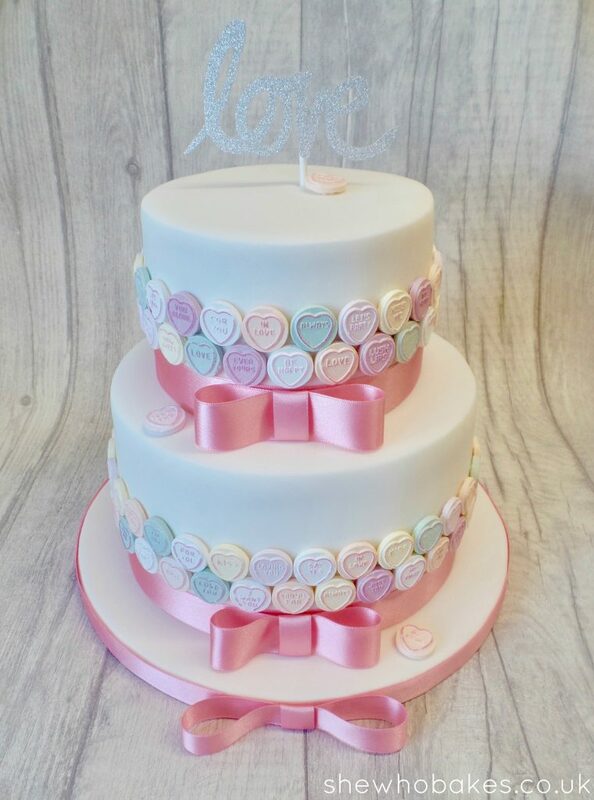 Finally to decorate I stuck on Love Hearts sweets around the cake just above the bow. 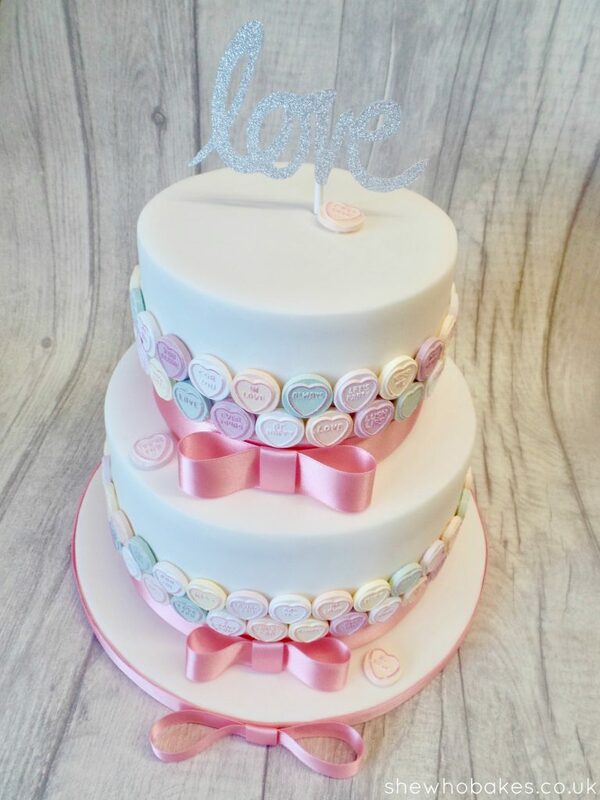 I did two layers and for a 7″ round and 5″ round cake I used 5 full sized packs of Love Hearts with a few leftover for me to enjoy. I stuck them on using a little melted white chocolate in a piping bag. You can also use Royal Icing but I didn’t have any in or edible glue. Lastly, to top the cake I’ve used a silver glittery ‘Love’ cake topper from Iced Jems. I felt it was a really nice finishing touch! And there you have it! I loved making this one! If you’ve got any other questions on this cake, pop them below and I’ll do my best to answer them. Have a sweet Valentines Day and happy baking! 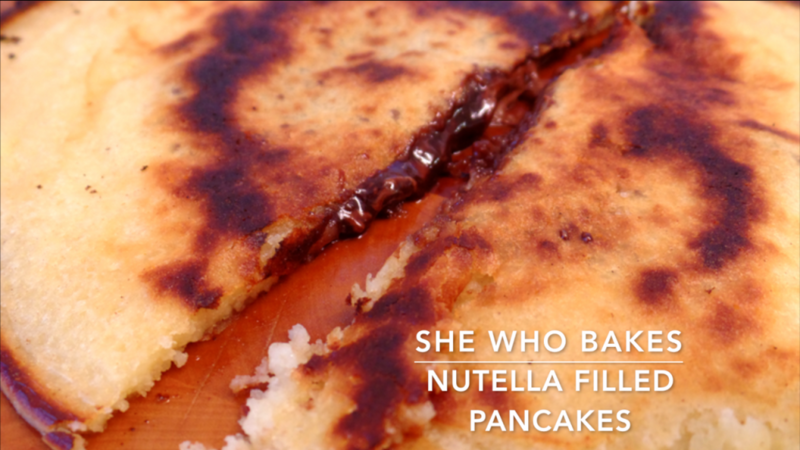 Nutella Filled Pancakes! 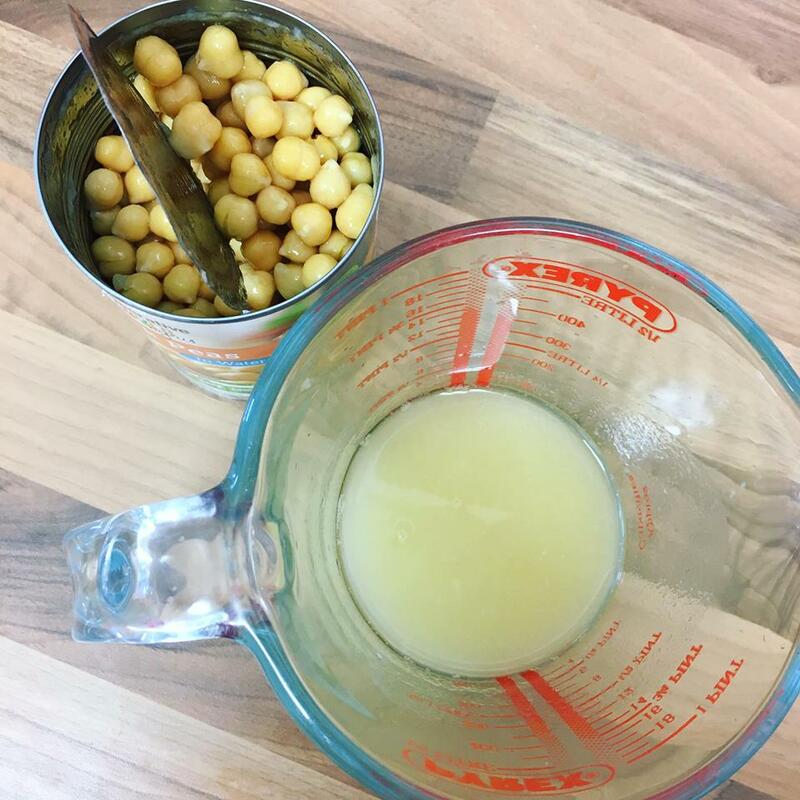 Quick and easy and perfect for Pancake Day! Mix the flour and baking powder with the milk and mix well until it is smooth and lump-free. Pour in a little batter. Cover the Nutella with a little more batter. These are best straight from the pan. If they have cooled, zap in the microwave for gooey Nutella-ness. Give it a try and let me know how you get on either on Facebook or Twitter and Instagram. 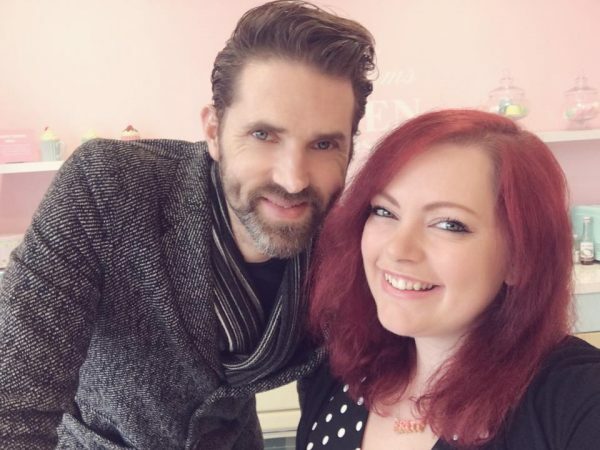 This week was my darling fiancé Tim’s birthday! I couldn’t let it go by without baking him something tasty! I’ve incorporated all of his favourite flavours in this 6″ almond cake with almond buttercream and black cherry jam. 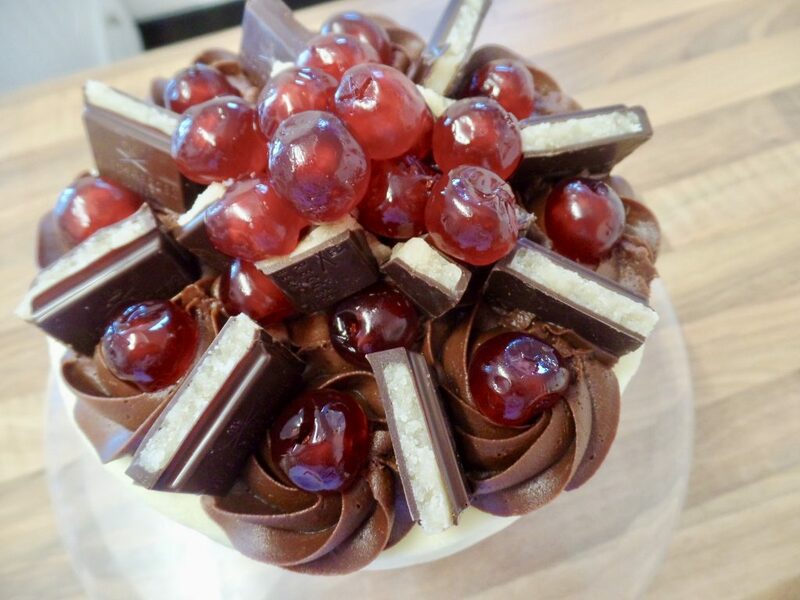 Topped with dark chocolate ganache swirls, pieces of marzipan dark chocolate bar and glacé cherries. 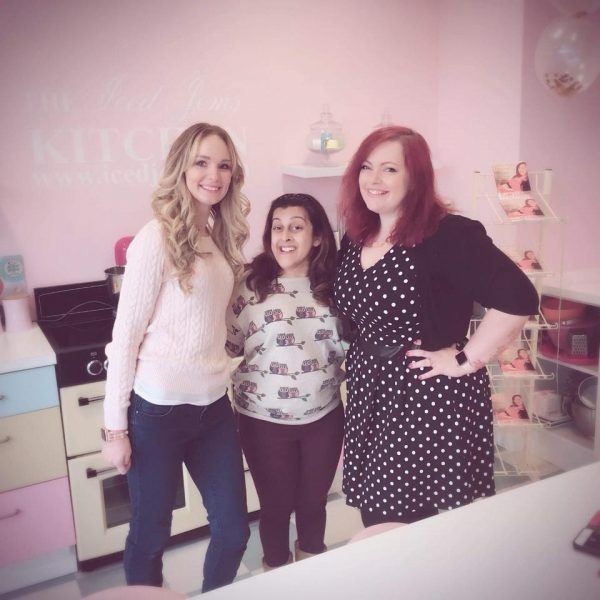 A little bit of information about the cake! I used the Classic Madeira Birthday Cake recipe I like to use but instead of all the plain flour I used half so 25g and added 25g ground almonds. I also used almond extract instead of vanilla. I also didn’t convert the recipe size even though I was using a smaller tin, this is because I wanted a tall cake. I will often bake a size bigger recipe in the tin if I want a deep cake. For the almond buttercream, I used 250g unsalted butter, 500g icing sugar and 2 teaspoons of almond extract. 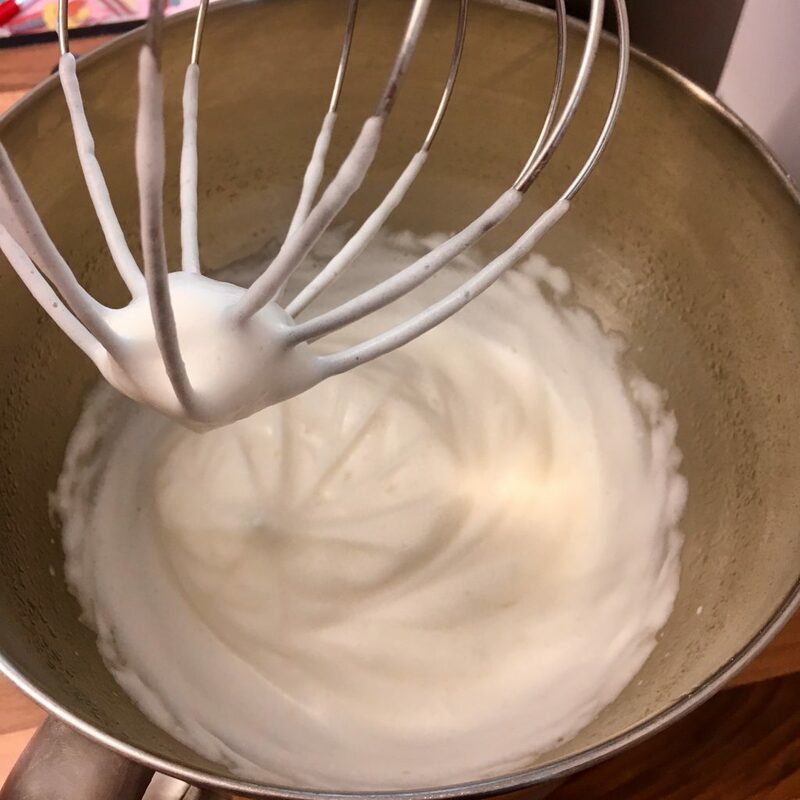 No water or milk, just nice soft butter to make a creamy buttercream. I used the dark chocolate ganache recipe I have here for the chocolate swirls on top. 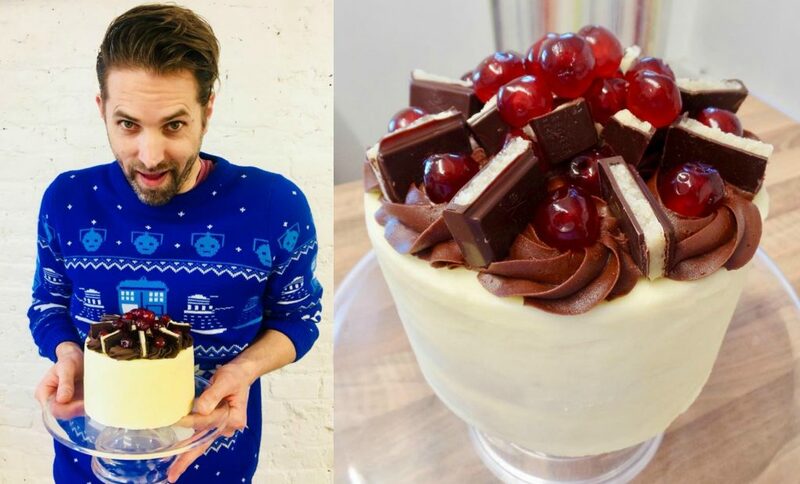 I used marzipan chocolate and glacé cherries from the supermarket. 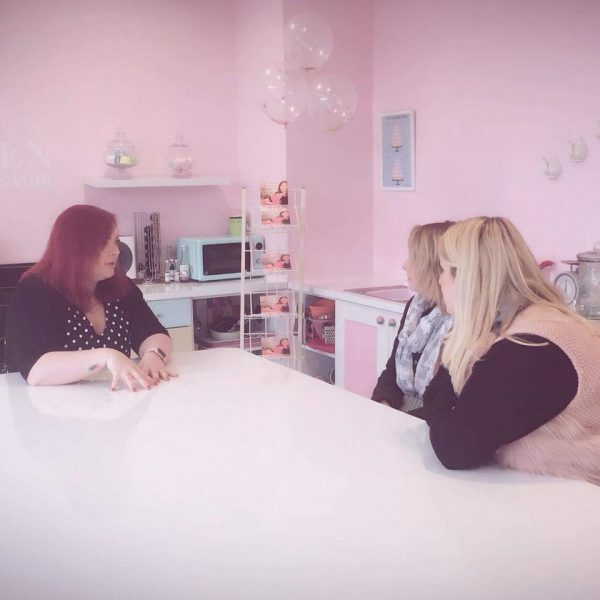 Here’s a lovely shot of the inside! 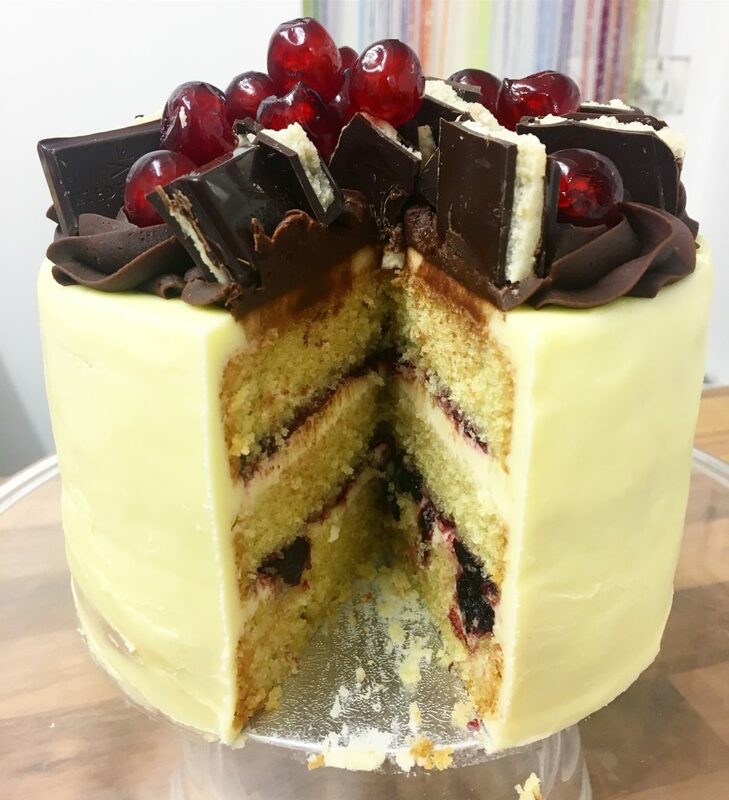 Cut with a cake leveller and filled with chunky cherry jam and almond buttercream! Delicious! Happy birthday handsome. I hope you had an amazing day!! I love you so very much. 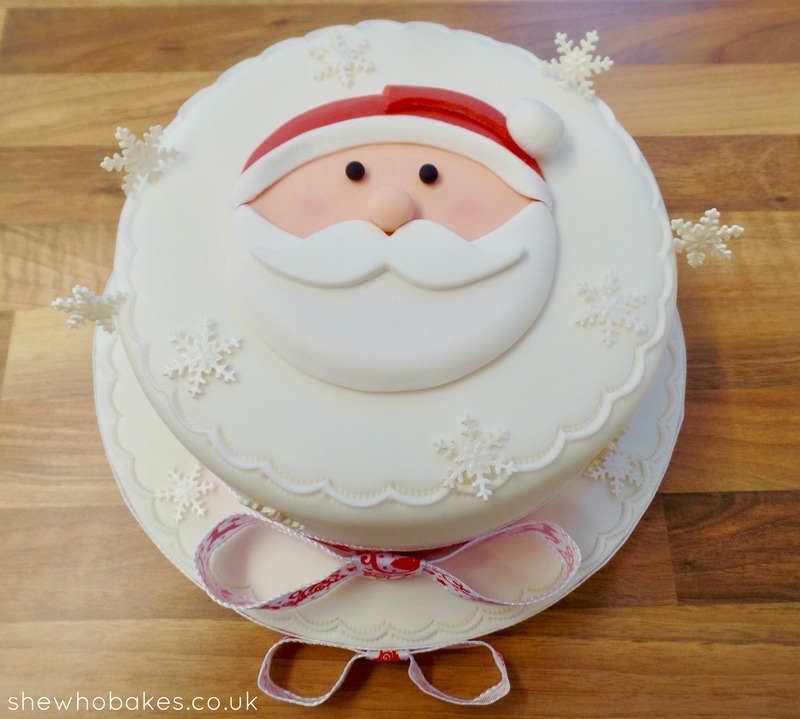 At this years Manchester Cake & Bake Show, I demonstrated in the Baking & Decorating Classroom, how to make this fun and festive Santa Face Cake! Follow my below tutorial to make your own for a fabulous centrepiece for your Christmas celebrations. 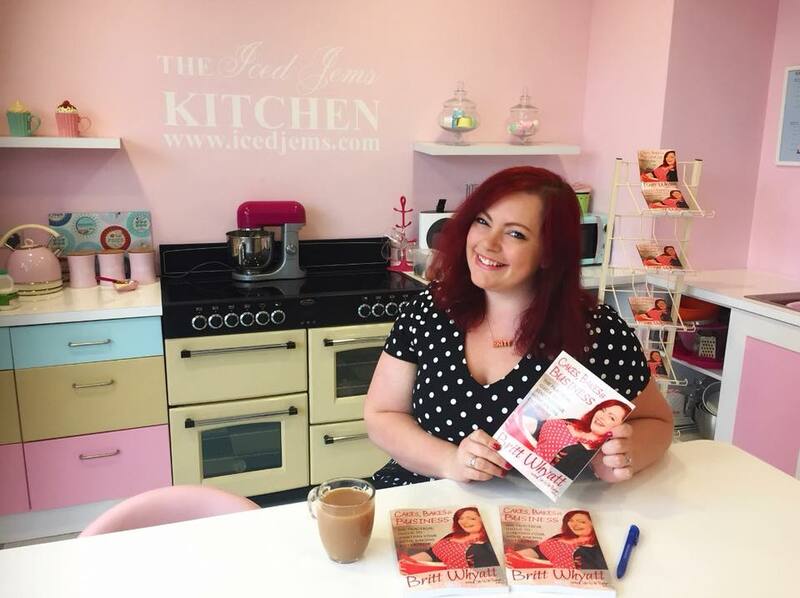 I’m using my 7″ round madeira cake recipe and vanilla buttercream. Both recipes can be found here. 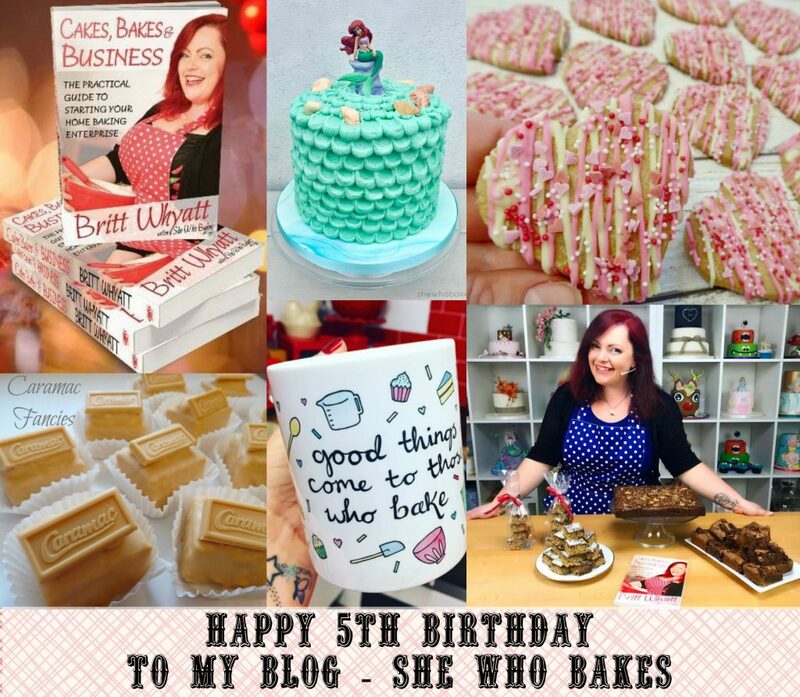 For my cake timeline, which takes you thorough when you can bake and decorate your cake, click here. I recommend using modelling paste to make the face as it’s less fragile. It can also be made on a smaller scale and used to decorate cupcakes! The face and snowflakes can be made ahead of time, keep decorations in a cake box or another container that the air can get to (not in a sealed box, otherwise they may melt). 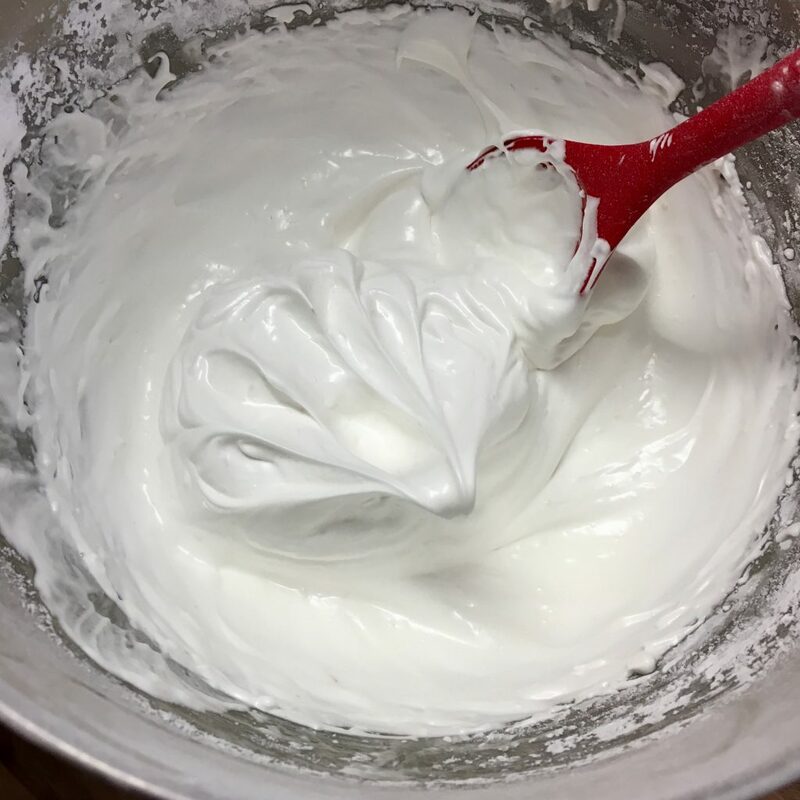 For more on types of icing, check out my blog post here. Ideally, leave your decorations to dry overnight until they are firm before using to decorate. For this I have used white modelling paste and coloured what I needed using Sugarflair colours Paprika/Flesh. I use pre-coloured red and black modelling paste. Roll out flower paste very thinly and use a snowflake plunger cutter. 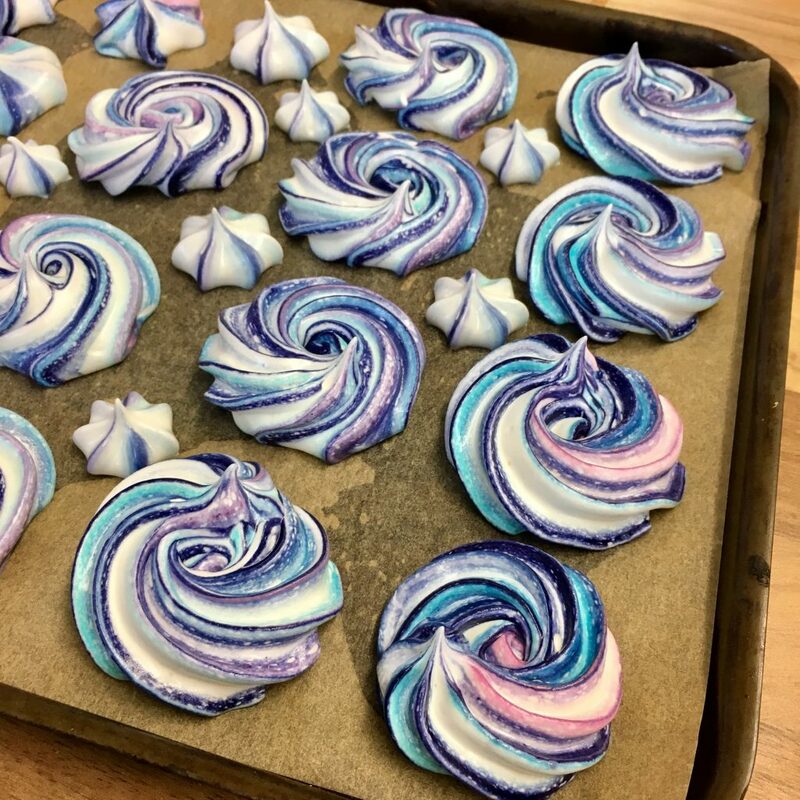 Leave these snowflakes to dry on foam overnight and when dry, attach with edible glue and by gently sticking the snowflakes into the side of the cake. I have also sprayed mine with shimmer spray but this is up to you. Split and fill your cake with your desired buttercream or ganache and secure your cake to the thin board using buttercream. Before rolling out icing, knead until it’s a workable consistency. 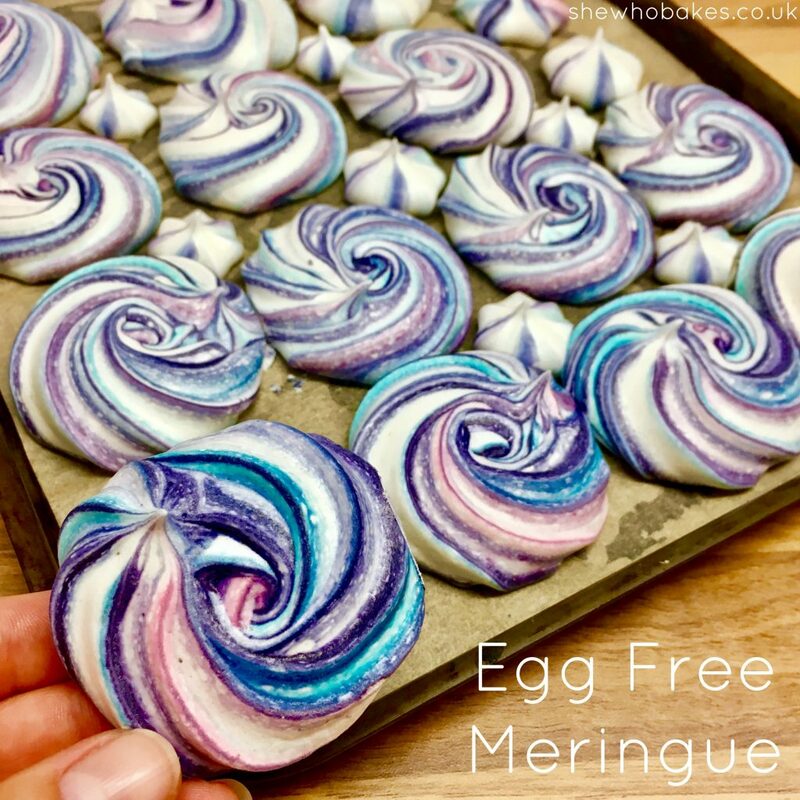 If the icing is sticky or your hands are very warm, sprinkle lightly with cornflour. Lightly dust your smooth work surface also to prevent it sticking. Roll out your sugar paste to a 1/4 of an inch thickness. If it helps, you can use icing spacers which are perfect for this. 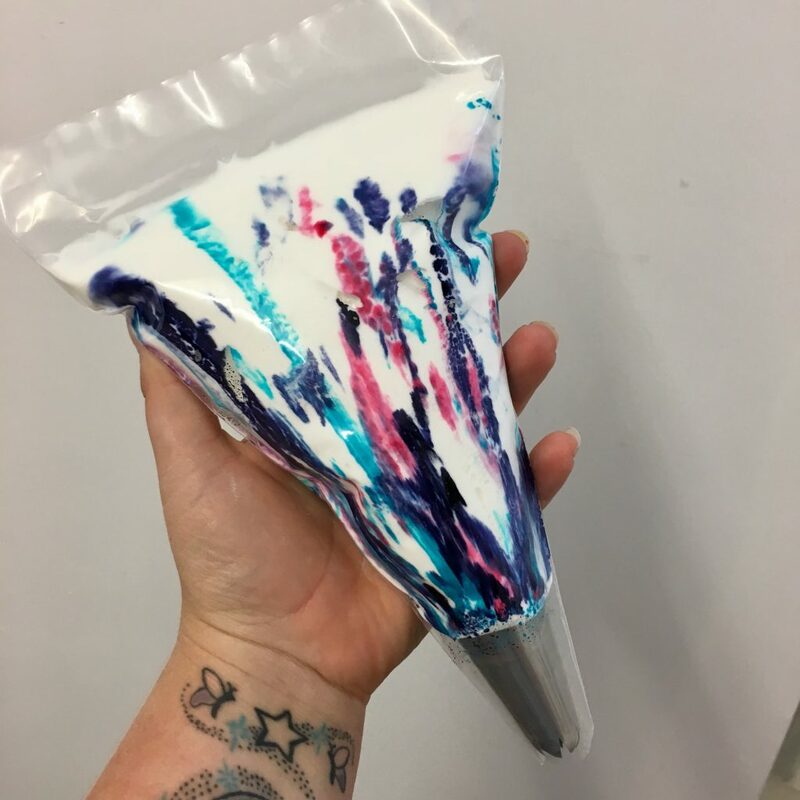 Shape sugar paste to sides of cake using your hands and then your smoothers. I recommend using a smoother because the pressure of your hands may leave impressions on your sugar paste. Beginning in the middle of the cake top, gently rub the sugar paste onto the cake. 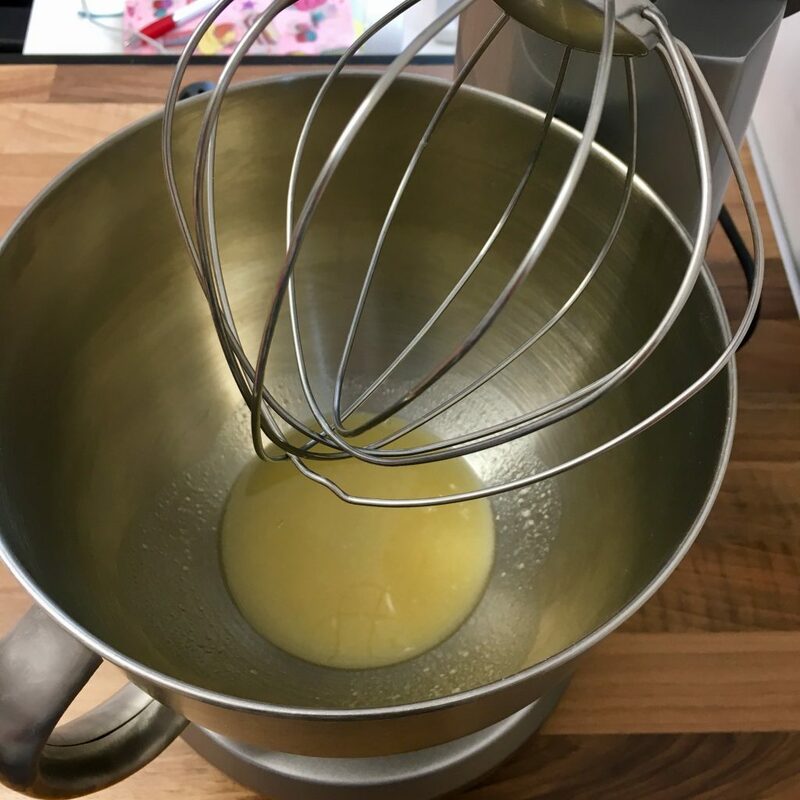 Start on one side and by a process of gently lifting any creases out and lifting down onto your cake, you can secure the sugar paste all the way around. If an air bubble appears, use a scribe to gently pop the bubble and smooth the air out. Use your smoother to mark the sugar paste at the base of the cake and trim the excess using a palette knife or sharp knife. 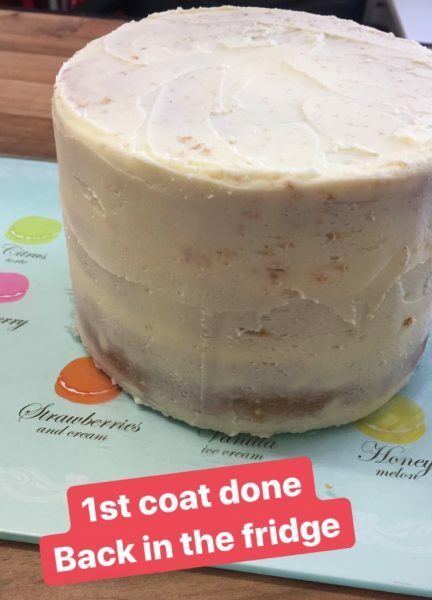 Repeat this process to ice the board, sticking the icing down with a little water or piping jelly. 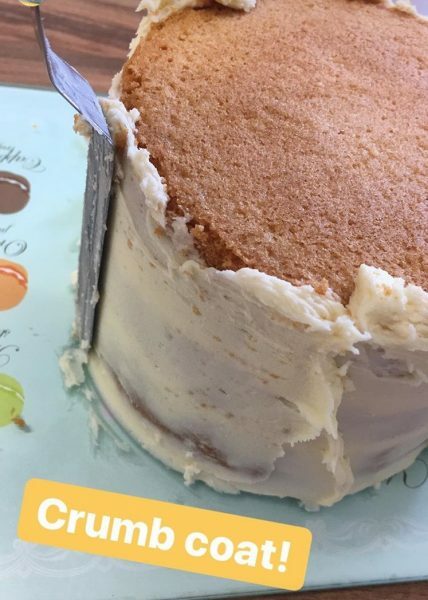 Using a crimper, crimp the edges of your icing, starting at the back of your cake and board. Go around evenly and decisively. Fix your iced cake to your iced cake drum with a little royal icing. Your cake is now ready to decorate! 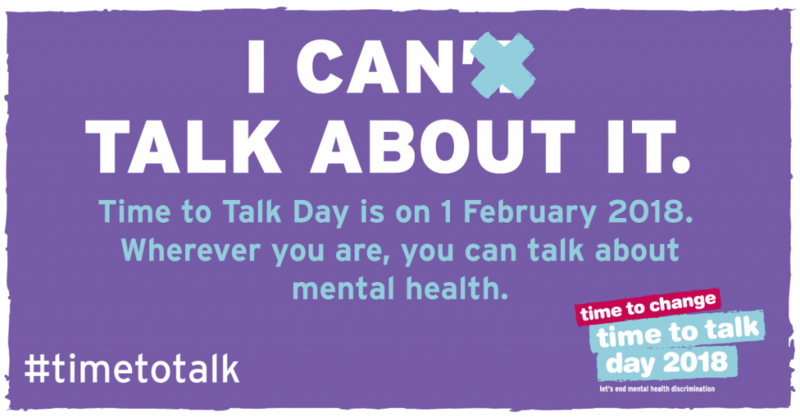 Roll out peach coloured icing to ¼” thick. Cut out a circle using a large circle cutter. This will be Santa’s face. Leave the face to dry on a piece of foam. Roll out white icing to the same thickness. Cut out the same sized circle as the face then cut a third of that circle out with the same cutter, creating a crescent shape. This will be his beard. 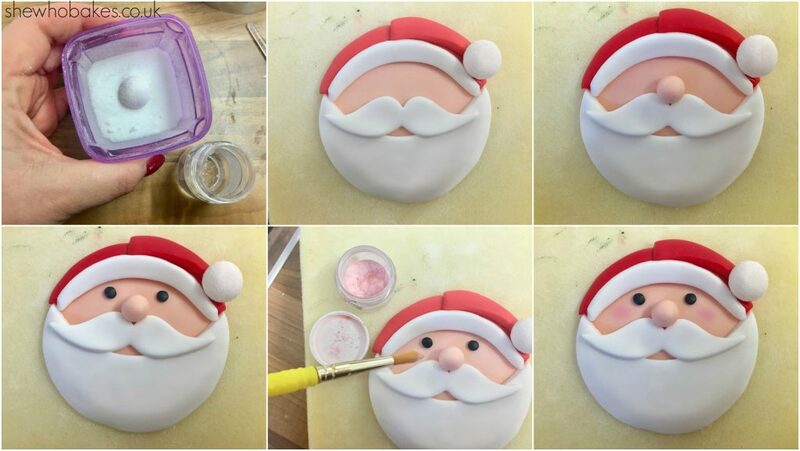 Using a little edible glue, stick the beard to the bottom half of the face making sure to cover the bottom ridge of peach icing. 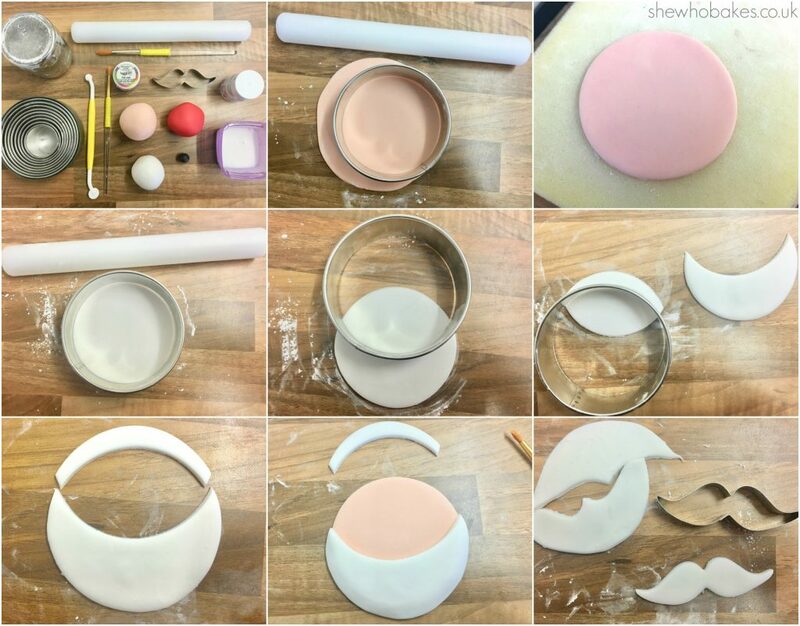 Then cut out a white moustache using a cutter or cut one out freehand using a cutting wheel. Glue this onto the beard. 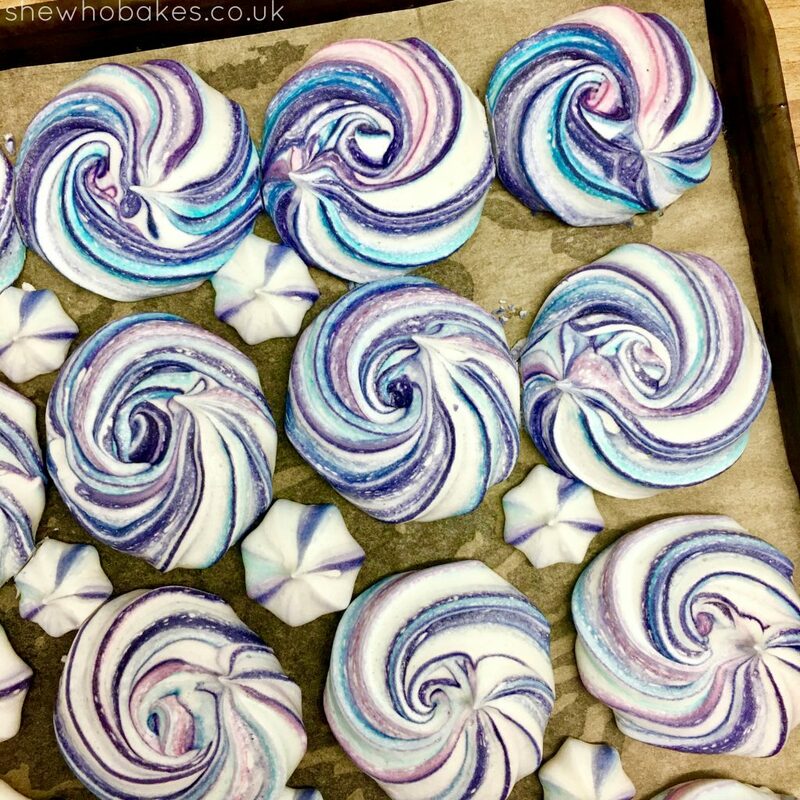 Roll out red icing and cut out the same sized circle as the face then cut two thirds of that circle out with the same cutter, creating a smaller crescent shape. This will be his hat. Stick this to the top of the face using a little edible glue. Then, using a cutting wheel, cut out an elongated triangle, gluing it to the hat, starting in the middle. Then, for the bobble, roll out a small ball of white icing, paint thinly in edible glue and roll in caster sugar. Glue this at the end of the hat point. 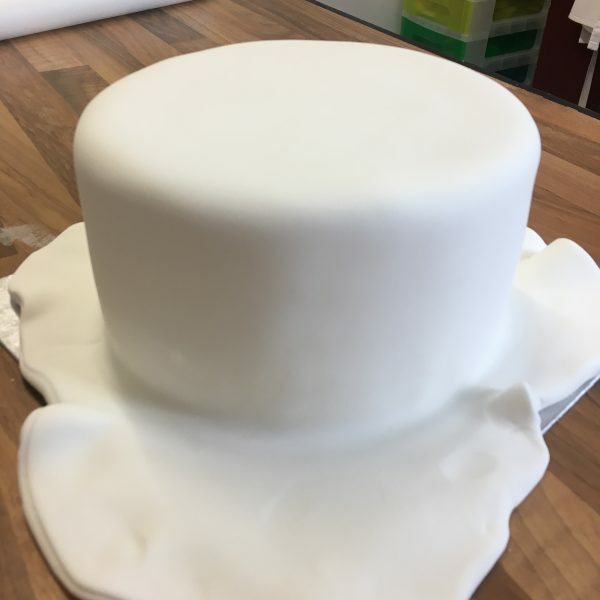 Roll out a thin strip of white icing and glue this around the base of the hat to create the rim. 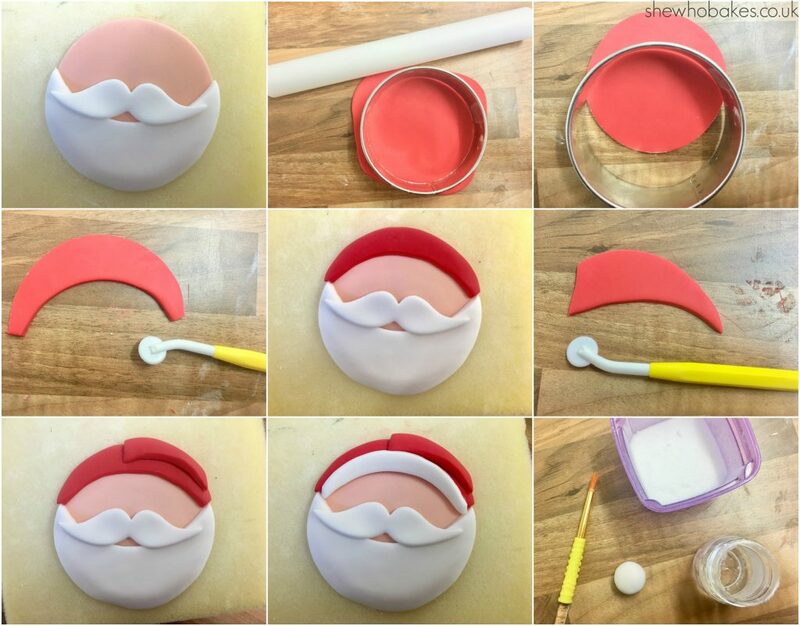 To finish the face, roll a small ball of peach icing and glue just above the moustache to create the nose. Roll two smaller balls of black icing and glue in place for the eyes. For the flush cheeks, use a large dusting brush and pink edible dust colour. Dab a little colouring onto the cheeks. 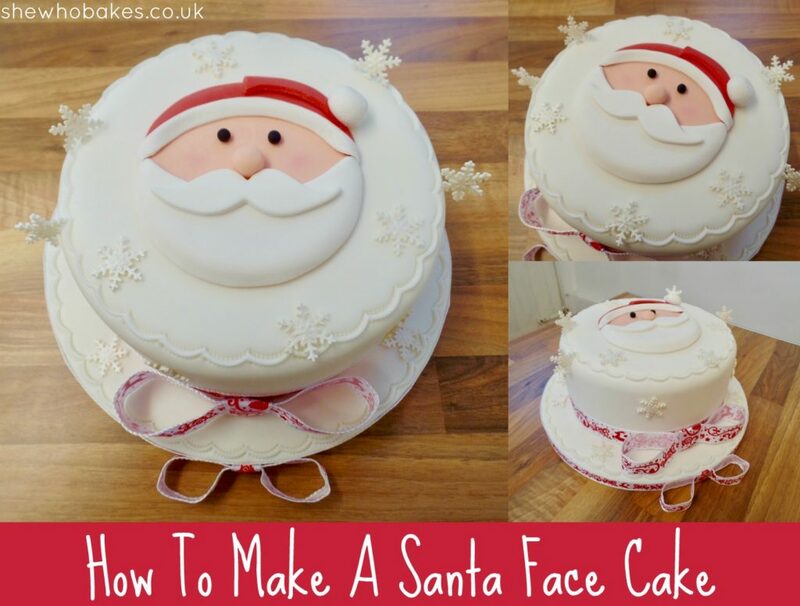 When your Santa face has dried, glue this to the centre of your cake using a little edible glue. Finish your cake with a ribbon and bow around the base of the cake and the rim of the board. I have big news!! 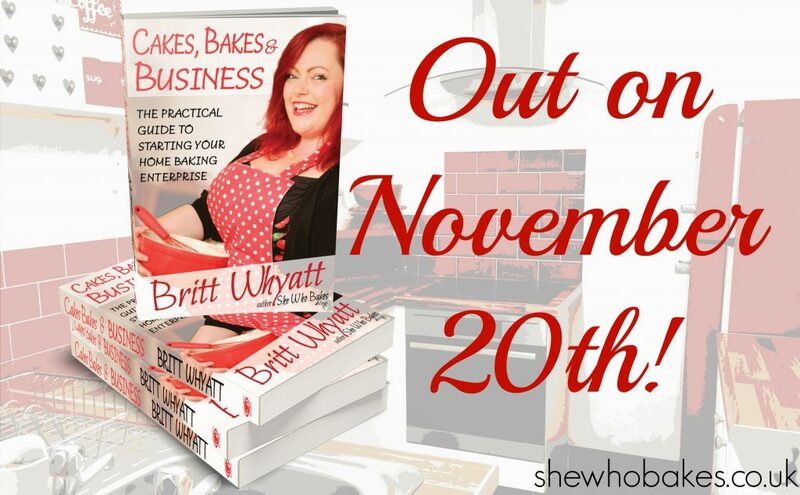 My book Cakes, Bakes & Business will be released on Monday 20th November!! I’m pleased to say it is already listed on Amazon and can be pre-ordered here! 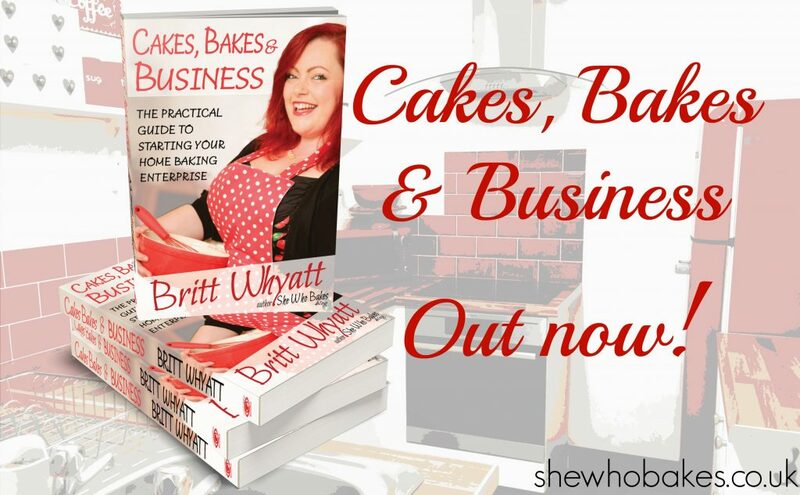 The perfect Christmas present for anyone wanting to start making money from their tasty cakes and bakes!